You can view all your course assignments on the Assignments page. Note: Your instructor may choose to hide the Assignments link in Course Navigation. 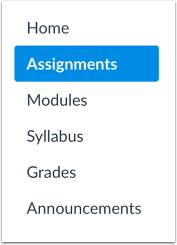 If the Assignments link is not available, you can still access Assignments through your user or course dashboard, the Syllabus, Gradebook, Calendar, or Modules. 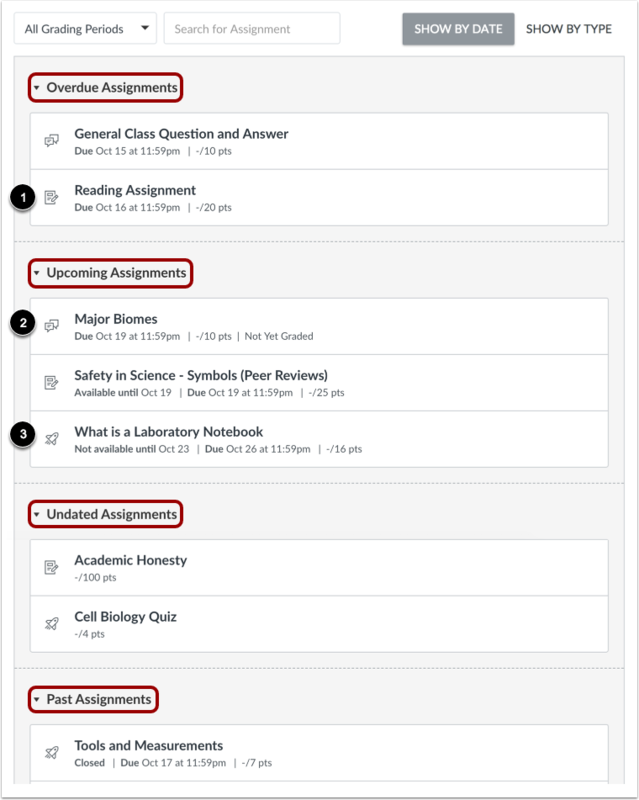 In Assignments, you can view all the assignments in your course. By default, assignments are grouped by overdue assignments, upcoming assignments, undated assignments, and past assignments. Overdue Assignments: assignments and discussions that are past the due date, are still available, have not been submitted, and have not been graded. Upcoming Assignments: assignments, discussions, and quizzes that have an upcoming due date. Undated Assignments: assignments, discussions, and quizzes that do not have a due date. Past Assignments: assignments and discussions that are past the due date and either are not available, have been submitted, or have received a grade; quizzes that are past the due date. Each assignment also includes an icon with the assignment type: assignment , discussion , or quiz . Each assignment displays the assignment name , any availability dates for the assignment , due date (if any) , and the number of points the assignment is worth. The first dates you may see are called availability dates. 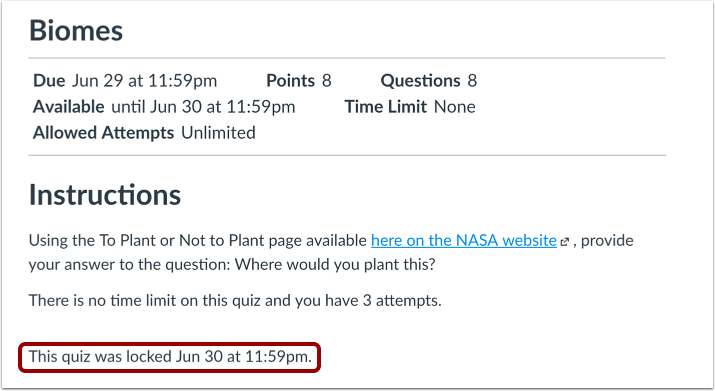 Sometimes your instructor only wants you to submit an assignment during a specified date range, so the available dates are the range of time that the assignment is accessible to you. If the assignment does not have a date listed, the assignment is open; you can submit the assignment at any time during your course. If the assignment says Available until [date], you can submit the assignment until the specified date. If the assignment says Not Available Until [date], the assignment is locked until the specified date. If the assignment says Closed, the assignment cannot accept submissions. Note: If a date does not include a time, the listed date defaults to 12 am. Therefore, the last day for the assignment is the full day before the listed date. For instance, if an assignment is Available until December 15, you can access the assignment until December 14 at 11:59 pm. The second set of dates are the Due dates  for each respective assignment. Any assignments submitted after the due date are marked as late; some instructors may deduct points for late submissions. Again, not all assignments may include a Due date. You can still submit late assignments before the Available until date. Please be aware that the Due date may be before or on the Available date. Due dates also include a time . If your instructor does not set a specific time, the assignment due time defaults to 11:59 pm and submissions will be late if submitted after 11:59:59 pm. 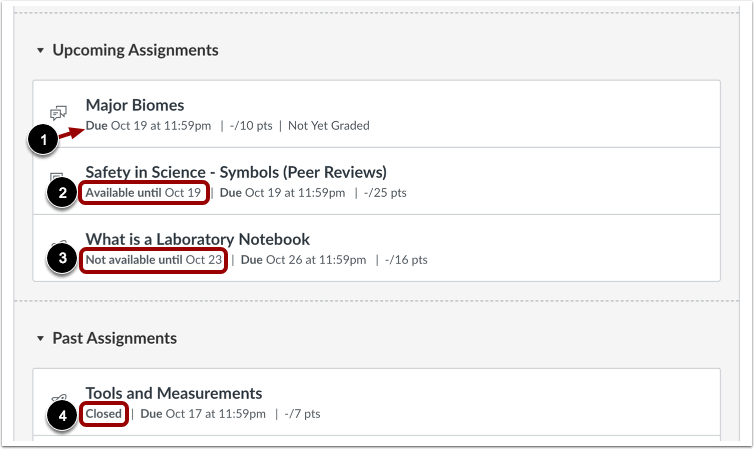 If your course includes Multiple Grading Periods, you can view assignments by grading period . You can search for an assignment by typing an assignment title or a keyword in the Search for assignment field . You can also group assignments by type . To view the details of an assignment, click the name of the assignment. When an assignment is open to you to submit at any time, you can view the due date, points, and the type(s) of submission(s) you can use for the assignment . Not all assignments may have a due date. Instructions : any instructions that your instructor has about the assignment. Please note that you cannot download assignment instructions unless your instructor has included a link to download them. You can also print the screen or copy and paste the directions into a word processing program, or you can also view the assignment in the Canvas mobile app. Rubric : any grading criteria that your instructor has provided for the assignment. An assignment may or may not include a rubric. Before submitting your assignment, you may want to review the assignment rubric. For example, an assignment may have a due date but may not list any other dates. If you were to miss the due date, you could still submit the assignment for late credit before the last day of the course. If the assignment does not have a due date, you can submit the assignment at any time before the last day of the course. To submit your assignment, click the Submit Assignment link . Note: You can always re-submit an assignment unless your instructor has set availability dates for the assignment. When an assignment is open to you during availability dates, you can view all available assignment information in addition to the specific dates the assignment is available to you. Availability dates may include a first available date (open date), last available date (locked or closed), or both dates to create an overall date range. The Due date may be before or on the last available date (if one is set). If you were to miss the assignment submission due date , you could still submit the assignment until the last available date . Once the last date passes, you can no longer submit the assignment. An assignment can be locked before an instructor wants it open, or after a specific date has passed after the due date. 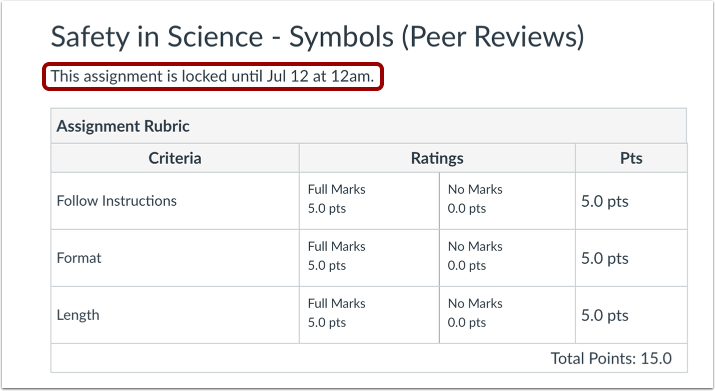 When an assignment is locked, you can view the rubric (if any) and the assignment details. You can also view the date when the assignment will be open for submissions if it has not been opened yet. When an assignment is closed, you can still view the rubric, if any, and any existing submission details in the sidebar, but you can no longer view the assignment details or submit/re-submit the assignment. You can also view the date the assignment was locked to submissions. Assignments close when they are only available until a specific date. Previous Topic:How do I like a reply in a course announcement as a student? Next Topic:How do I filter assignments by type as a student? Table of Contents > Assignments > How do I view Assignments as a student?